The resident cats at Blakkatz. Click on any photo for a larger sized version. Rooney is the oldest member of the Blakkatz crew is not an American Shorthair, but a domestic shorthair. 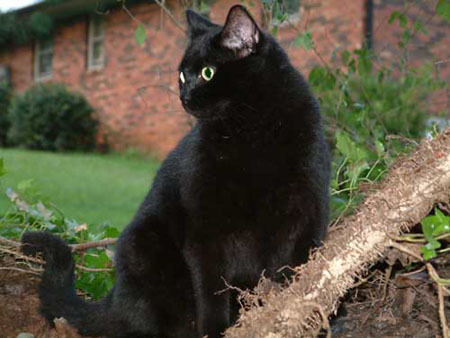 The first of the black cats, Rooney was adopted from an animal shelter in Massachusetts in 1991. Rooney was converted to a raw diet in 1993 and has been gloriously healthy ever since. Getting brushed or combed is Rooney's favorite pastime, as is trying to steal my food. His favorite food, besides mine, is chicken. Rooney has put up with a lot over the years living with pregnant mother cats and kittens who love to chase his tail, but as is the case with all truly healthy animals, he rolls with the punches. He turned 13 April 2004, but he doesn't look or act a day over five. The first grand champion of Blakkatz, GP Blakkatz Yukon Cornelius (GC Karibe's Whodo Voodoo? of Blakkatz x CH Jo-Ni Trompe-l'oeil of Blakkatz) was born January 28, 1999. 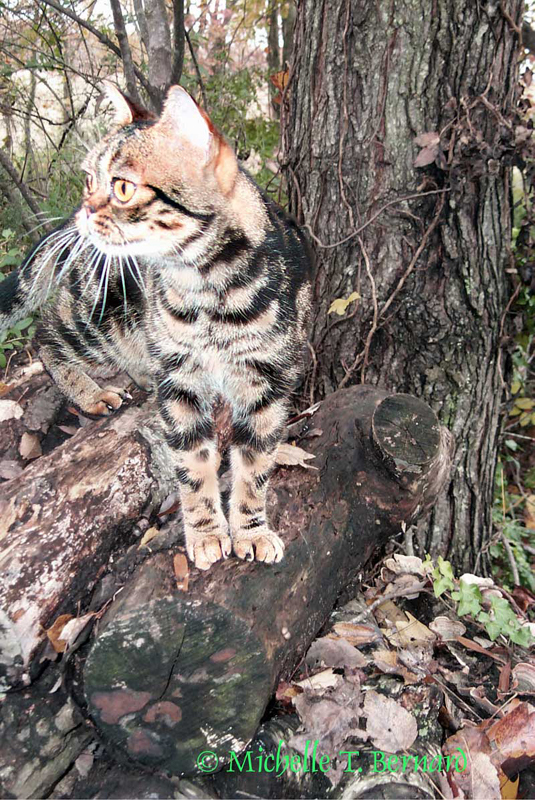 Yukon had a fabulous show career as a kitten, then his development stalled which is not unusual in a raw fed animal. Yukon granded easily as neutered cat and is now "on the shelf" until he fully matures. He's almost there, but I expect I'll take him out when he's about ten. Yukon loves Rooney (to Rooney's irritation sometimes) and has to know everything that's going on in the household. He tells you about it too. Yukon is stunning beyond belief. Sweet tempered and loving every four legged creature he meets, Yukon is a joy to live with. Yukon is first generation naturally raised. While to some extent I regret neutering him at ten months old, but he's my bed buddy and never had to live the life of a stud male. 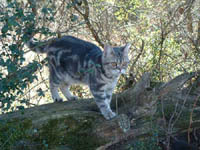 CH Jo-Ni Charya of Blakkatz is a blue tabby female who will be five in November 2004. Ms. Charya made it abundantly clear that showing was not her cup of tea. This is unfortunate because she's one of the nicest American Shorthairs I've ever seen. Her pattern and color are phenomenal. Charya is mother to Oleander and grandmother to Tangle. Charya who is an excellent mother, has had four litters of kittens, the most recent, a trio of brownies, were born May 17, 2004. Because Charya is shy and sensitive to changes in her surroundings, she will never be placed. We have developed an understanding over the years and I do not think she'd adapt to a new caregiver. This is Charya's daughter from her first litter, CH Blakkatz Oleander born February 27, 2001 (CH Jo-Ni Nocturne of Blakkatz x CH Jo-Ni Charya of Blakkatz). I love Olie's eyes. They are huge and brilliant gold. She has excellent color and pattern. Olie's last litter of kittens was born March 1, 2004. Oleander's show career was delayed due to my move to North Carolina and in maturity she got too short in the muzzle to be shown. Oleander is first generation naturally raised and mother to Tangle. 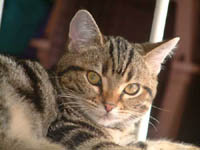 Olie will be spayed this year and is available to be placed in an approved home. Please contact me if you are interested in Oleander for more specifics on her placement. 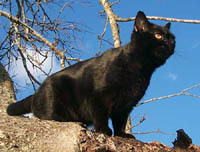 Blakkatz Hermione's (CH Jo-Ni Nocturne of Blakkatz x GC Jimnet Waking the Moon of Blakkatz) sole purpose in life is to amuse me and cause trouble. I could have sold Hermione several times over as a kitten, but I held on to her. She can't be shown due to a tail fault and so far she's resisted pregnancy. Hermione has her own agenda in life and she lives it to the fullest. I have never seen such an opinionated, but happy-go-lucky cat. Hermione is a Bombay-wannabe with a powerful, but compact body. I really wish I could have a litter of kittens from her, but then again, I wouldn't be surprised if Ms. do-as-she-pleases Hermione, decided once she had the kittens, motherhood wasn't for her. It's all so unglamorous. Hermione will most likely be spayed this year and as difficult as it will be, I would be willing to place her in the right home. She is an intelligent, delightful companion. Please contact me if you are interested in adopting Hermione for more specifics on her placement. Oleander has always taken it upon herself to decide to whom and when she will be bred. A few weeks before my move to North Carolina in 2002, Oleander delivered a litter of two kittens. Although the timing was severely off, she gave me the great gift of CH Blakkatz Tangled up in Blue. Tangle is every bit as nice as her grandmother, Charya, and even better in many respects. Her temperament is stable and fun loving. Tangle's first show experience was when she was a year and a half old. 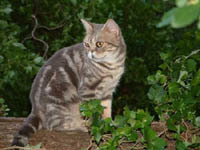 Her first litter is due the end of May 2004 which will yield third generation naturally raised kittens. Once she's recovered from raising kittens, I will continue to show Tangle towards her grand championship. Like Yukon, Tangle took her dear sweet time maturing. She's there now and deserves to be shown. It took a long time to get a suitable male to compliment my females, but thanks to a wonderful breeder in Canada, Rumscott Matrix of Blakkatz joined the crew in October 2003. Matrix has everything my females are lacking. He is father to the litter of kittens Charya delivered on May 10 and Tangle's litter which is due the end of May. Matrix is a silly, silly boy and a great pleasure to live with. Because he's such a sweet boy, he will be neutered and placed in a pet home in late 2004 or early 2005.